Mission Inclusive: paving the way to a disability-inclusive society | The Forum Network, hosted by the OECD: Shape ideas. Shape policy. Shape the Future. Sabine Rehbichler is the International Programmes & Advocacy Director at Light for the World, an international disability and development organisation whose vision is an inclusive society where no one is left behind. People with disabilities and their families and supporters belong to the most excluded groups in society, be it in health, education, political representation or the job market. Fifteen percent of the world’s population is living with a disability, according to the World Disability Report. Eighty percent of these 1 billion live in developing countries. The International Day of Persons with Disabilities is the perfect platform to remind ourselves and everyone else that we need to address this significant group in order to stand a chance of achieving the UN’s Sustainable Development Goals (SDGs). The scale is clear, as are the international frameworks guiding the implementation: the 2030 Agenda for Sustainable Development contains 11 explicit references to persons with disabilities across several goals and targets. In addition, the SDGs’ core principle “leave no one behind” should also be understood as a rallying call for inclusion. 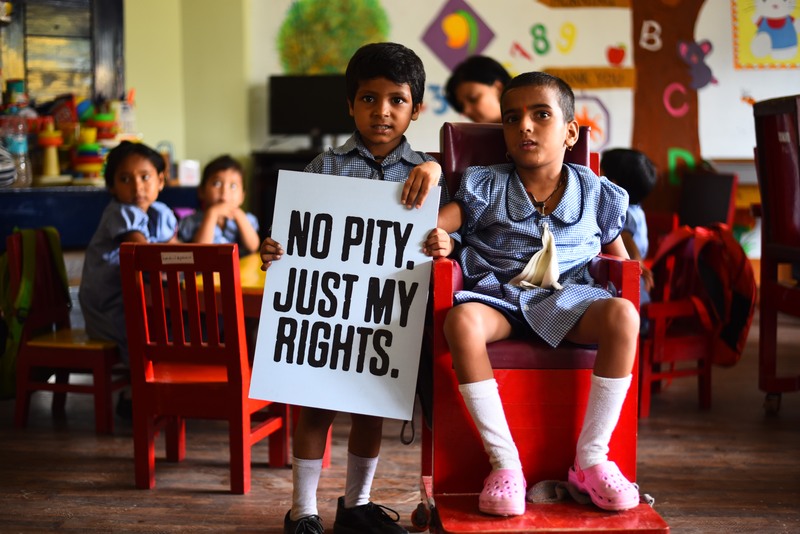 THE guiding tool on inclusion and accessibility, which can and should be realised, is the UN Convention on the Rights of Persons with Disabilities (CRPD). It is currently ratified by 175 states and is particularly remarkable as the first UN human rights treaty signed by the European Union. Article 32 gives clear responsibility to international and development co-operation, in support of national efforts, to realise the purpose and achieve the objectives of the Convention. This includes an obligation for any country that ratified the CRPD to make their international development programmes inclusive and accessible. Another positive step is that the OECD DAC has reviewed the Common Reporting Standards (CRS) against the SDGs and has set specific targets on inclusion of people with disabilities. It is important that the newly introduced OECD DAC disability marker becomes operational as soon as possible and that inclusion of persons with disabilities is no longer treated as a voluntary add-on. Instead it needs to be a must-have ingredient of all areas of development and the fight against poverty. At Light for the World, we help influence the international agenda whilst our programme work on the ground is being guided by the respective frameworks. We cannot do it alone though, which is why we work with partners, Disabled People’s Organisations (DPOs), NGOs, networks and governments. As my colleague, Yetnebersh Nigussie once said: “If you want to go fast, go alone; if you want to go far, go together”. To achieve systemic and sustainable change, we bring concrete evidence and learnings from our programmes in partner countries to a national, regional and a global level and vice versa. A case in point of filling policies and theories with life is the area of education – something which Nelson Mandela rightfully called the key to development. In developing countries, there are an estimated 32 million children with disabilities out of school. This figure is unacceptable and means a violation of these children’s fundamental right to education. Light for the World supports inclusive education, where all children, with and without disabilities, learn together in the same class room. We engage with the education sector, education ministries, local authorities and schools as well as with the disability movement, children with disabilities and their parents, DPOs and local communities to build up the necessary practice and awareness to influence policies so that no child is left behind. Join us in our fight for an inclusive society!